Their study points to opportunities for therapeutic interventions — even in the first few weeks of life — to improve premature babies’ long-term outcomes. The research, which focused on infants born at least 10 weeks early, is available online and will appear in an upcoming issue of the Journal of Pediatrics. A study led by Bobbi Pineda, PhD, above, has documented the developmental differences between premature babies in the NICU and full-term babies. 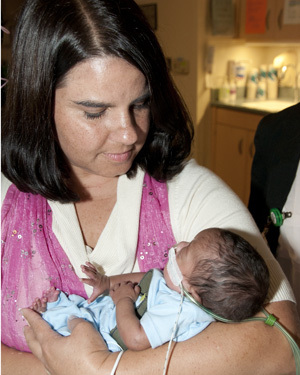 The research points to opportunities to intervene in the NICU, to improve preemies’ long-term outcomes. “We found that by the time premature infants are at or near their original due dates, they have significant developmental differences compared to full-term infants,” says first author Bobbi Pineda, PhD, research assistant professor in Washington University’s Program in Occupational Therapy. The study reports on 75 premature infants at St. Louis Children’s Hospital who were evaluated in the NICU at 34 weeks gestation and again at 40 weeks, the length of a full-term pregnancy. The babies also received an MRI to detect brain injuries that could be related to premature birth. Comparing the preemies to full-term babies, researchers found major differences in muscle tone, reflexes, stress levels, the ability to be soothed and handled by caregivers and the ability to visually track objects and people in the NICU. Pineda says one of the biggest differences involved the fact that premature babies typically have low muscle tone early in development. The flexed position that is assumed at birth is supported by the cramped uterine environment in the final trimester of pregnancy. However, when infants are born early, they miss this experience and the brain has not yet matured to the point that it can signal the infant’s muscles to become flexed. Pineda says that the extended positioning in the NICU can interfere with the babies’ ability to calm themselves and to coordinate movements smoothly. “Low muscle tone can be an extra challenge to overcome in order to achieve normal developmental motor skills, like rolling over, sitting up and crawling in the first year of life,” she explains. Typically, premature infants are released from the hospital when they can stay warm without an incubator, be fed by mouth and are able to breathe well without supplemental oxygen, Pineda says. But she suggests interventions in the NICU may help them catch up with full-term babies who have had more time to develop and grow in utero. For example, more intensive physical and occupational therapy might help babies get stronger before they are discharged from the hospital, and she says it’s important that the therapy continues when the babies go home. Pineda is continuing to work with premature babies as part of a large study funded by the National Institutes of Health (NIH). Terrie E. Inder, MD, professor of pediatrics, is the study’s principal investigator. Those babies will return for follow-up testing at 2, 4 and 6 years of age. Testing the babies over time can help determine whether therapies and interventions have helped them get on a normal developmental path or if differences between premature babies and their full-term counterparts continue to linger into early childhood. Funding for this research comes from the Eunice Kennedy Shriver National Institute on Child Health and Human Development (NICHD) of the National Institutes of Health, the Intellectual and Developmental Disabilities Research Center at Washington University and the Doris Duke Foundation. NIH grant numbers ROI HD 057098 and NIH/NICHD P30 HD062171.